We had an enquiry recently for funding for a small recruitment startup that was expecting to turnover a few hundred thousand pounds sterling. We provided them with a quote for factoring, prepayments against invoices and a credit control outsourcing service. The quote we initially found was for an all inclusive fee of £3,800 + VAT per annum. Which is reasonable for a whole turnover facility that enables them to draw funding against all their invoices, and means that they will enjoy a full credit control service provided by the funder. We are continuing to search for lower quotes, but that is good value and gives predictability as the cost is fixed without any additional discount fees to worry about. The issue was that the client had not budgeted for the financing costs within their financial projections, or therefore their sales prices. In that situation, any fee would of course seem expensive. If you are starting a business, you need to firstly understand if you require financing. In many cases there is a need for an injection of working capital, especially when starting a new recruitment agency, and that capital will come at a cost - unless you have it yourself or you can borrow at zero percent. When you plan a new startup, you should produce cash flow forecasts that show how the cash will flow through your business. These will indicate whether or not you are going to have working capital shortages, and hence if you will need to borrow to close that funding gap. Your cash flow forecasts can be adjusted to include the effect of receivables financing services such as factoring or invoice discounting. 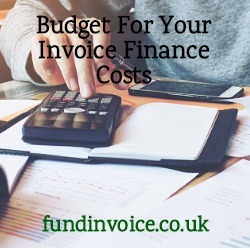 A far better approach is to include your financing costs within your budgets - we are happy to provide prospects with estimated costs in advance, and there are examples of invoice finance prices on our website. These can then drive your pricing approach in setting the prices for your customers. If your financing costs are included within these figures, and hence within your sales prices, your customers will be paying for your funding within their purchase prices. If you argue that your margins are unable to tolerate the cost of financing then you either need to revise your business plan, or find an alternative way of closing the funding gap, at a lower cost e.g. borrowing at zero percent from family or injecting your own capital. Can You Finance This New Startup? How Many Invoice Finance Quotes Do You Need? The Difference Between Profits And Cash Flow - Need Help?